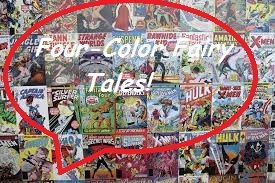 Fairy Tale Fandom: Four-Color Fairy Tales: Walt Kelly's Fairy Tales. Four-Color Fairy Tales: Walt Kelly's Fairy Tales. Well, this book proved to be a semi-pleasant surprise. Why semi-pleasant? I’ll explain later. I nearly missed this book. Luckily, an ad for it popped up on my Facebook wall. I even had to have my local comic book shop order it because they hadn’t heard of it. The book is Walt Kelly’s Fairy Tales published by Yoe Books, which is a division of IDW Comics. The book is a collection of comics drawn and written by cartoonist Walt Kelly and published as part of the series Fairy Tale Parade and Famous Fairy Tales by Dell Publishing back in the late ‘40s and early ‘50s. Kelly was a former Disney animator who moved on from animation some time in the late 1940s and went into producing comic books and comic strips. He was the creator of the comic strip Pogo and some would argue the greatest cartoonist in the world. Dell Publishing was a comic book publisher during the ‘40s and ‘50s that almost entirely specialized in making more comedic comics including those based on famous cartoon characters. Dell’s comics created some truly classic interpretations of classic cartoon characters. For example, it was in Dell Comics as well as newspaper comic strips that Donald Duck became a put-upon family man whose stingy uncle dragged him along on adventures designed to make him richer. Dell’s comics also had their share of not-classic reinterpretations. For example, the comic book version of the Road Runner was a character who spoke in rhyme and had three sons who followed him around. Truly a mixed bag. Dell still exists, but they no longer publish comic books. Now, first of all, this is a truly beautiful book from the outside. It looks like a big, red hardbound storybook with gold embellishments. Some of the gold parts even look worn to simulate the book being older and well-used. It’s even got a ribbon attached to the spine that can be used as a bookmark. The book itself starts out with both a foreword by Dean Yeagle and an introduction by Craig Yoe. 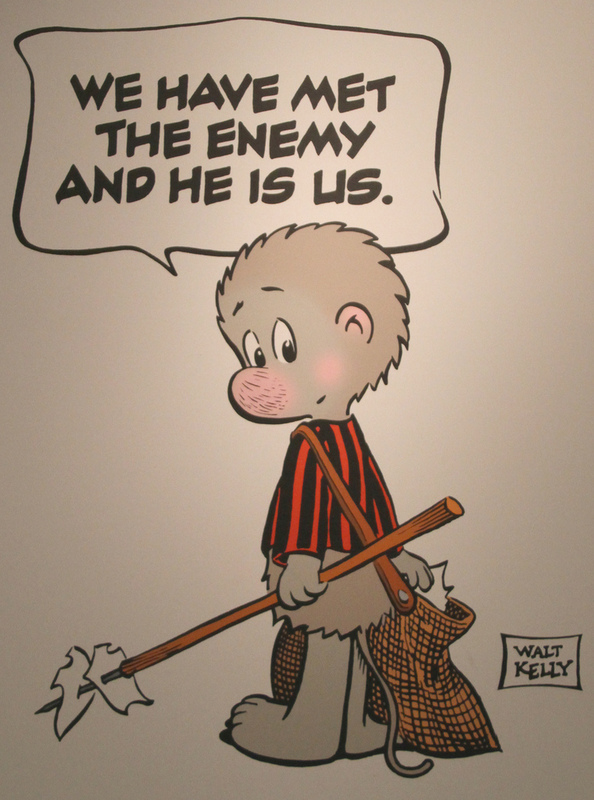 Both of them provide interesting history and insight into Walt Kelly and his work. Now, as we get into the main material of this book, let’s get one thing straight. If you’re looking for a more modern “dark fairy tale” approach, you’re in the wrong place. These comics stem from a time when both fairy tales and comic books were viewed as exclusively for children. That said, it’s some good work. The stories are amusing and the cartooning is top-notch, which you should expect from Walt Kelly. There are even some lovely covers presented in the book, with ornate work by Kelly. Sometimes I have a little trouble with how the panels and captions are formatted, but that may be more a result of the era these were printed in than anything else. Many of the stories are adapted from writers and collectors like the Brothers Grimm, Charles Perrault, Hans Christian Andersen and Joseph Jacobs. There’s even a Washington Irving story in there (which, I should note, is based on a New York State legend. But that’s a post for another day). However, there are also some original stories in the book, and that’s where my main issue lies. While the original stories are okay, I’m just not as interested in reading those as I am the adaptations. The second half of the stories in the book are mostly originals, notably focusing on a race of Kelly-created characters called the Tiny Folk that look like fairies crossed with toddlers but which act kind of like Smurfs. I know the reasoning behind it. These were the stories that were drawn by Walt Kelly while other cartoonists drew the other fairy tale adaptations (they’re listed on some of the back covers printed in the book). I guess I just wish there were a general Fairy Tale Parade collection that showcased the other artists and their stories as well. Still, it’s not terrible. This is probably the one chance these stories ever had of being reprinted. If this sounds interesting to you, give it a try. Just beware that you may be left wanting something more that’s not included in this volume.